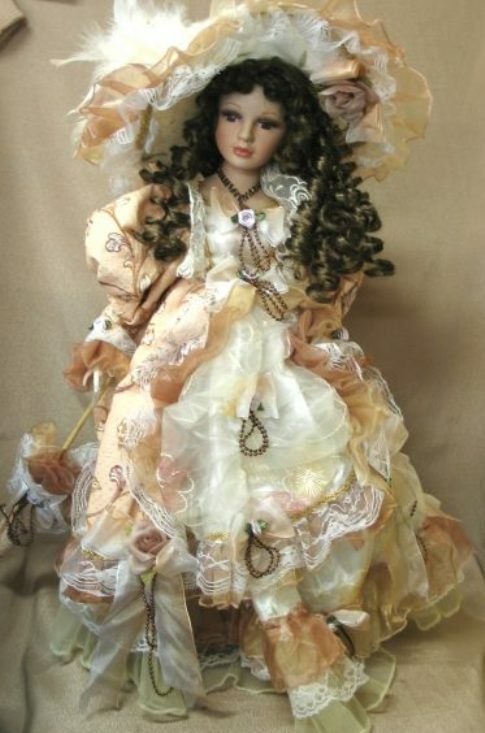 Author doll – this is a rare art that requires a high level of skill and perseverance. There are many techniques in which modern craftsmen make dolls. More simple techniques include working with polymer bake plastics, but still an extremely valued traditional porcelain handmade dolls. To create a doll made of porcelain is not easy, but the finished porcelain doll will delight you with its elegance and refinement. First and foremost, you need to prepare the model and to come up with a sketch of the doll, as well as to determine where it will be connected to movable parts of the doll. Apply the thumbnail of the attachment locations of the joints. Clamp the joints of the doll with a hat elastic. From paperclay or modelling clay vilaite parts of the doll, sand and smooth them and then paint. Determine which side of the part is the hole for pouring the porcelain – this hole should not be visible in the finished doll. To detail dolls dolemite funnel through which you pour the liquid porcelain. Divide the details into two or three parts, holding the line of incision in places difficult terrain. Now let's focus on removing forms from clay to make podmogilny, oblepicha model along the marked line of division, and then make it recess back side of the pencil. The edges of podmodelnuju from clay make the sides, then prepare a mixture of plaster, whip it and pour in podmogilny. When the first part of the form hardens, remove podmogilny and lubricate detail of the form with vaseline. Make the sides and pour the plaster. Of the form reanimate and remove the model. The edge of the form sand. Dry form for two to three days at room temperature. Gather together the dry form and pull her elastic or wire, leaving the desired location of the hole for pouring porcelain. Porcelain mix and pour into the prepared funnel to the brim shape, pouring slowly to avoid air bubbles. After five minutes drain the remaining porcelain from the molds, and after three hours, remove the rubber bands and disconnect form. Carefully remove the porcelain detail, cut off the funnel and make holes according to the scheme of fastening of the joints. Manufacture in this way the head, torso, arms and legs of the doll. Dry the parts and sand the seams, the remainder of the form before firing. Then anneal porcelain items, observing the rules of change of temperature in a furnace, and finally, when the part has cooled, begin to paint a doll's face, using acrylic paint on ceramics and porcelain. Assemble the doll together using a hat elastic, first securing the body on both hands, and then securing the head to the feet. Push the loop through the metal washer, so it does not slide off. Now all you have to modify the doll to come up with clothes, accessories, make her hair. Porcelain – a difficult material, so to create a doll out of it, you may need more than one week. However, it's worth it. Not for nothing is from China created collectible dolls and figurines. Making dolls from porcelain consists of several stages. At first you need to create an image of your future doll. Draw a diagram of puppets, determine which joints it will be agile, how will you connect the individual parts of it. The next step is the manufacture of parts. From clay, plasticine or other material vilaite individual parts of your doll. Every detail of the sand, because then all the existing irregularities will be visible on a porcelain cast. If you produce parts from paperclay cover them with varnish. In the manufacture of all the parts you need think about where will be a hole for the pouring of the porcelain, then it was impossible to see on the finished product. For example, the holes in the parts of the body will close down the clothes, and the head – hair. In addition to the details of the doll dolemite gate – there is a funnel which is then filled with liquid porcelain (slip). Each model, divide the line into two or three parts so that it was on the ground with the most difficult terrain. For the manufacture of podmodelnuju use window putty or clay, which will place the model on a pre-planned line. Gypsum pour podmogilny so that the surface was not a single air bubble. After the plaster hardens, the mold is ready. Dry it for two to three days at room temperature and can continue the process of creating a doll. The dried form, assemble and staple a taut rubber band horizontally and vertically and put a gate up. In the hole of the sprue pour porcelain (better toned) to the edge of the shape. Do it slowly to avoid air bubbles or cavities. Wait about 5 minutes, to give time to gain the desired thickness (2-3 mm), drain the remaining porcelain and after 2-3 hours remove the rubber bands and gently reanimate form. Carefully make holes in parts until it is soft and your detail is fully ready. Repeat the procedure with the remaining parts and connect them together. Making dolls – a question only your imagination. 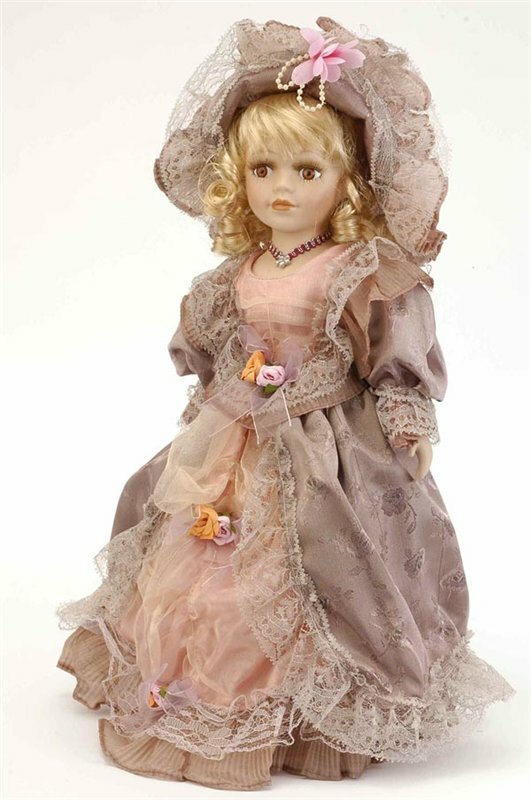 Doll of porcelain – a perfect gift for any occasion.